It’s no secret that two-wheeler brands are preparing an armada of products that would arrive post the implementation of BS-VI emission norms. Last month, Eicher Motors’ CEO, Siddhartha Lal had dropped hints of a new product line up with the enforcement of the emission norms. The rendered motorcycle features a headlight and tail lamp grille, along with blacked-out panels for a rugged look than the Interceptor INT 650. Other off-road bits include knobby tyres that are seen on the rendered motorcycle. 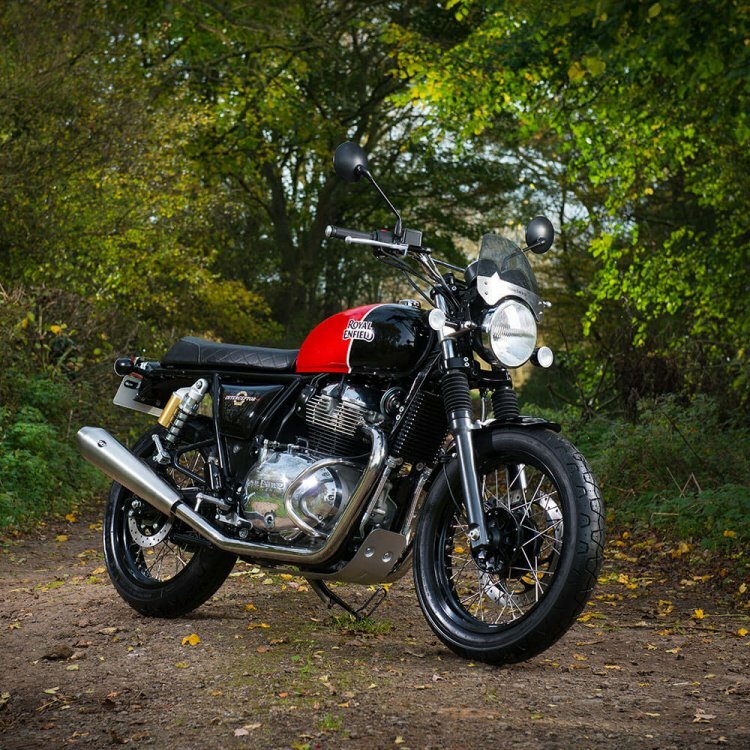 A report this year said RE plans to introduce motorcycles based on four new platforms – P, J, Q and K. The company has already revealed the 650 Twins – the Interceptor INT 650 and Continental GT 650 – that are underpinned by the P architecture. Lal had confirmed that the company would not introduce more products on the 650 platform for two years. Thus, the next product to arrive under the P architecture would have a BS-VI compliant motor. The upcoming product list based on the 650 platform will include a bigger Himalayan. A Scrambler style motorcycle cannot be ruled out, and thus, we asked our artist to create one that is near-identical to the Interceptor INT 650. However, the rendered motorcycle gets its traits to make it off-road ready. The fascia, for example, features a headlight grille that adds a rugged look to the front. The fork gaiters are aimed to protect the oil seal against various elements. The units are already available as part of optional accessories for the Interceptor INT 650. The fuel tank comes with rubbers on the sides to enhance the grip to the motorcycle while off-roading. The tank recesses and the retro-style fuel filler cap are identical to the ones that are seen on the Interceptor INT 650 and so are other features like the side panels and the saddle layout. The Interceptor INT 650 comes with 18-inch wheels on both ends, and the same has been imagined on the rendered motorcycle. However, the wheels on the Scrambler are shod with off-road spec tyres. Almost all the chrome bits from the Interceptor INT 650 are imagined in black paint to give the motorcycle a rugged look. The rear of the rendered motorcycle features an identical tail light setup as the Interceptor INT 650 although, similar to the front, the tail too received a grille to protect it from debris. Mechanical and hardware specifications are not likely to be different from the Interceptor INT 650, and thus we expect to see the same 648cc, parallel-twin cylinder, air & oil cooled, SOHC engine with Bosch sourced fuel injection and management that also propels the 650 Twins. The tuning will most likely be retained, and the motor would continue to deliver 47 bhp of maximum power at 7,250 rpm and 52 Nm of peak torque at 5,250 rpm. The low-end torque (80 per cent of peak torque at 2,500 rpm) will come handy while tackling various obstacles on the beaten path. The engine will continue to push power to the rear wheel via a six-speed gearbox featuring a slipper clutch with an assist function. The Scrambler may receive a revised gear ratio that would be achieved with a larger rear sprocket. A larger sprocket will reduce the top-speed marginally but would offer enhanced low-end acceleration. Anchoring tasks would be performed by twin-piston Bybre (by Brembo) callipers that grab a 320mm disc at the front and a 240mm disc at the rear. Bosch dual-channel ABS would come as standard we are hoping to see a switchable system on the Scrambler. A 41mm conventional telescopic fork would perform shock absorption tasks although we may see a more extended travel rating. The unit on the Interceptor INT 650, for reference, features 110mm of travel. At the rear would be twin-shock, gas-charge unit with piggyback reservoirs. The back features a 5-stage pre-load adjustment although the front cannot be fine-tuned as per the rider’s preference. If at all the Scrambler gets a larger front wheel and increased suspension travel, we could see an improved ground clearance. The Interceptor INT 650 features a 174mm ground clearance. Royal Enfield has no plans to introduce products based on the 650cc platform for the next two years. The new products would arrive post the implementation of BS-VI emission norms. 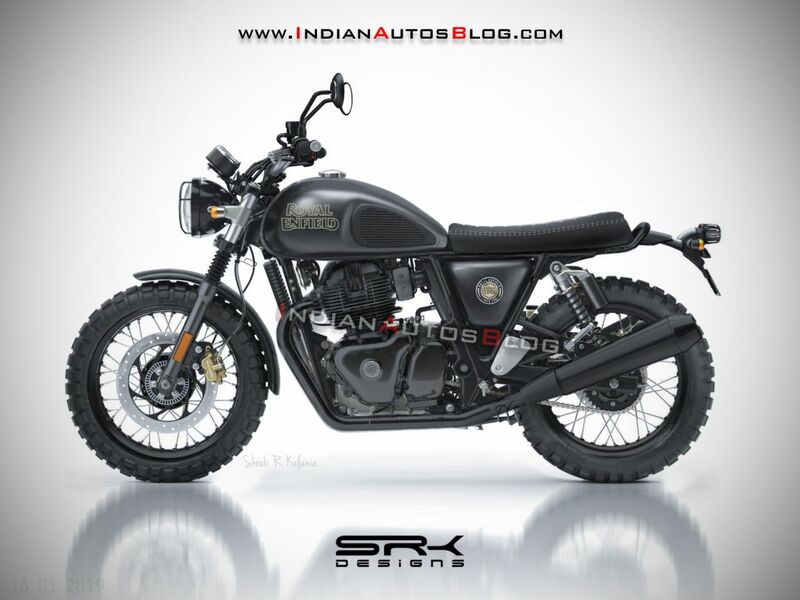 The Scrambler could carry a marginal premium over the Interceptor INT 650. For reference, the Interceptor INT 650 was launched in India at an ex-showroom Delhi price tag of INR 2,50,000.